Once you have created your campaign and decided on the best influencer profile, you can start looking for creators that fit your needs. To make a campaign offer to a content creator, you first need to add them to your campaign shortlist as outlined in the steps below. 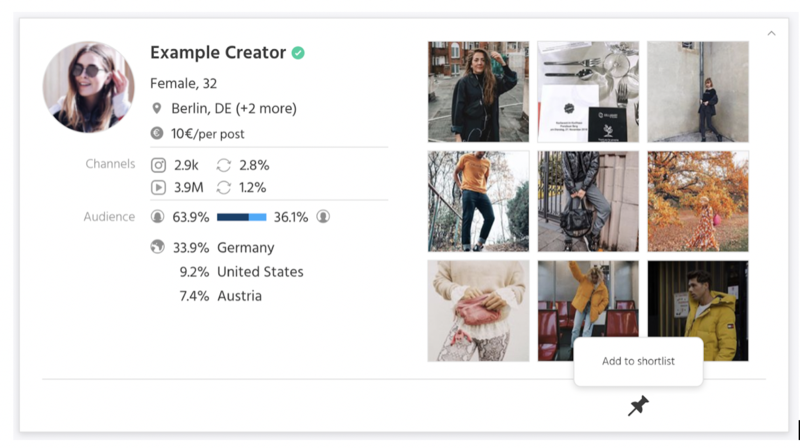 Once on the content creators search page, you can use the filters and search tools on the left-hand side panel to find the right content creators for your campaign. If you find an influencer your brand would work well with, click on their profile to explore their in depth statistics in regard to their social media accounts and followers to decide, whether they are perfect for your brand, or if you’ll continue looking. A modal will pop up with the name of your current campaign. You can add them to the shortlist by checking the campaign checkbox and clicking “Save shortlists”. Note: you can also add content creators to campaign shortlists straight from their statistics page. n the same way from the global content creators search always accessible under the “Content Creators” menu. After adding a content creator to your campaign shortlist, you can specify their individual campaign offer. To do this, navigate to your "Shortlist". Learn more here.